Short Description: "NEW" ergonomic design saves on your back but has a 200 lb. capacity hopper. LIST 14,523. All-around mixer grinder and easy to operate! Here is your all around mixer/grinder. It can do the big jobs as easy as the little jobs. Very easy to operate. Adjustable legs so you can raise or lower the machine to your desired height. What makes the mixer/grinder so nice is that you can mix and grind with the same machine. Easy to remove paddles makes clean up quick. Forward and reverse mixing. No. 32 grinding head. Internal safety switch. Includes splash guard. Direct driven auger. Stainless steel auger, bowl, and ring. 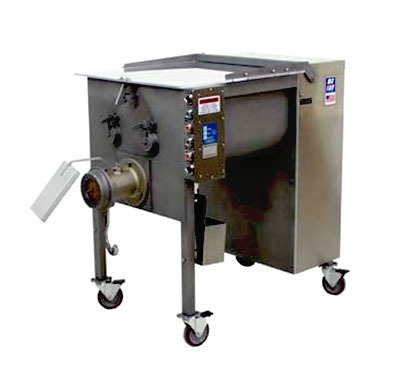 Optional foot control, stainless lid and grated stainless lid. Machines can be geminid.